Among all the children of men, it was common knowledge that some people were just born unlucky. They possessed freakish, uncontrollable gifts; flashes of insight into the minds of others, random glimpses into the past and future, the curse of the evil eye. There was little that could be done with such individuals; they congregated in the waste grounds on the edge of settlements, consulted by the unhinged and the desperate, as often as not driven mad themselves by the things they had seen and heard. Those with the mental strength to weather their curse sometimes acquired fame as witches, but even they seldom had any but the vaguest control over their powers. These unfortunates were known as the Blighted. One day, it so happened that an initiate of the Order of the Stone stayed in a Blighted encampment. Impressed by his lack of fear, and by the fortitude with which he weathered the ascetic ordeals of his Order, one of the inhabitants begged him to take her with him as a novice; for she had learned that suffering was unavoidable, and longed only to be able to encounter her ordeals with the same serenity with which she saw him face his own. She served a long and gruelling apprenticeship, made even harder by the curse with which she contended; but she persevered, and as she did so she discovered something remarkable. By adapting the meditative techniques of the Order of the Stone, she was able to develop a methodology for holding her curse at bay, and even bending it to her will; and this methodology she called the Diamond Mind. Now calling herself the Sage of the Diamond Mind, the woman returned to her old companions and tried to share her wisdom with them. Most of them proved incapable of mustering the necessary mental fortitude and concentration; but a few succeeded, and they became her first disciples. Wandering from land to land, they taught their secrets to others of the Blighted, men and women desperate to be free of their curse; and so the Order of the Diamond Mind was born. The laws of the Diamond Mind were simple, but extremely rigorous. Mind and body had to be strictly trained; emotions, desires, and fears were all subject to the firmest control. Like the Elemental Orders on whom they modelled themselves, the Disciples of the Diamond Mind lived lives of extreme simplicity, cultivating a state of perfect concentration, shunning stimulants and intoxicants, and ruthlessly suppressing every urge of flesh or spirit which might threaten to lead them astray. Many male Disciples even went so far as to castrate themselves, in order to free themselves from at least some of their bodily desires. For the successful, however, the rewards were rich: not just freedom from the curse of unwanted and incomprehensible knowledge, but the ability to control their powers, seeing into the minds of men and bending the world to their will. Today, almost anyone who is born Blighted will at least attempt to become one of the Disciples of the Diamond Mind, even if less than half of them ultimately succeed; and the Disciples themselves are to be found in many offices of high honour, serving as advisers to kings and magistrates for whom their insights are more valuable than gold. The Curse and the Cure: Being Blighted can happen to anyone, and usually manifests at adolescence. On average about one person in a thousand will be afflicted in this way, although some populations seem to have dramatically higher rates of affliction, for no reason that anyone has been able to adequately explain. As mentioned above, these days the first thing most people do upon realising that they are Blighted is to seek out the nearest Diamond Mind adept and beg for training, so most Blighted individuals that the PCs are likely to encounter will fall into one of three categories: inhabitants of remote areas with no way of getting Diamond Mind training (and possibly no knowledge that it even exists), Blighted adolescents roaming from town to town searching desperately for a Diamond Mind adept to train them, or drop-outs who lacked the self-control to complete their Diamond Mind training and have now resigned themselves to miserable lives on the fringes of civilisation. The third category will mostly consist of characters with Wisdom 9 or lower. Every Blighted character has a Psychic Instability score, which is rolled on 1d6. (Some exceptionally severely Blighted individuals can have even higher scores, but this is rare.) Whenever a Blighted character experiences fear, anger, or stress, they must pass a WILL save or experience an uncontrollable psychic outburst. (Characters who have had even basic Diamond Mind training receive a +1 bonus to this saving throw. Very extreme emotions or stresses might impose penalties, at the GM's option.) If an outburst occurs, roll 1d6, add their Psychic Instability score, and consult the table below. If a 6 is rolled, then put the dice aside, roll another 1d6, and add this to the total; keep doing this until you either stop rolling sixes or your cumulative total rises to 25 or higher, at which point a Psychic Holocaust occurs and you can stop rolling because everyone's probably dead. Note that any result of 10 or higher will be attended by phenomena which make it very obvious who is responsible: the Blighted character may bleed from their eyes, levitate off the ground, be surrounded by a miniature telekinetic whirlwind, or similar effects. Catastrophic psychic outbursts, leading to the deaths of one or more people, are often immediately followed by the lynching of the Blighted individual responsible. Bad vibes. Everyone within 50' suddenly feels very jumpy and uncomfortable, and will seize upon any excuse to leave and go somewhere less creepy. Very bad vibes. Everyone within 50' starts feeling mildly nauseous, and is filled with a sense of creeping dread. If they don't have a good reason for hanging around, they will leave the area as quickly as possible. Minor telekinetic incident. A random fragile object within 30' - a window, jar, etc - suddenly shatters as though from a violent blow. The horrors. If the person responsible for causing the Blighted character's emotion is nearby, they are suddenly filled with an overwhelming sense of horror and dread; they must make a WILL save or flee the area as fast as possible, and suffer a -2 penalty to all rolls until they've had a chance to spend several hours calming down. If they're not nearby, someone else at random within 100' suffers the same effect. Telekinetic incident. All fragile objects within 30' shatter simultaneously. If there are a lot of them, nearby characters may need to pass a REF save or take 1d3 damage from flying fragments. Mental blow. If the person responsible for causing the Blighted character's emotion is nearby, they must make a WILL save or take 1d6 damage and be stunned for 1d6 rounds by a sudden psychic blow. If they're not nearby, someone else at random within 100' suffers the same effect. Telekinetic slap. If the person responsible for causing the Blighted character's emotion is nearby, they are suddenly hit by a wave of telekinetic force; they take 1d6 damage (no save) and are sent sprawling. If they're not nearby, someone else at random within 100' suffers the same effect. Nightmare wave. As 'The Horrors' (see 10, above), but affects everyone within 100'. Sensory deprivation. If the person responsible for causing the Blighted character's emotion is nearby, they must pass a WILL save or be struck deaf and blind for 1d6 hours. If they're not nearby, someone else at random within 100' suffers the same effect. Psychic storm. Waves of psychic energy roll outward from the Blighted individual; everyone within 50' must make a FORT save or be knocked flying, taking 1d3 damage. Unsecured objects will be hurled about with great force. If this occurs within a populated area, assume a 10% death rate within the affected zone. Telekinetic crush. If the person responsible for causing the Blighted character's emotion is nearby, they are lifted off the ground by an unseen force which begins to crush the life out of them. They immediately take 1d4 damage; each subsequent round, they must attempt a FORT save to break free. If they fail, they take another 1d4 damage and are immobilised for another round. Keep rolling each round until they either escape or die. If they're not nearby, someone else at random within 100' suffers the same effect. This effect will kill most ordinary people. Brain-melter. If the person responsible for causing the Blighted character's emotion is nearby, they must make a WILL save or suffer 2d8 damage. If this damage is enough to kill them, their brains liquefy and pour out of their ears, which is really gross. If they're not nearby, someone else at random within 100' suffers the same effect. This effect will kill most ordinary people. Telekinetic detonation. Hundreds of inanimate objects within 30' explode violently and simultaneously into shards, rags, or splinters. Everyone within this area must make a REF save to throw themselves prone; if they fail, they take 1d6 damage. (In a heavily-cluttered area, this damage might increase to 1d8 or even higher.) If this occurs in a populated area, assume a 25% death rate within the affected zone. Mass sensory deprivation. As sensory deprivation (see 16, above), but affects everyone within 100'. Head-burster. If the person responsible for causing the Blighted character's emotion is nearby, they must make a WILL save or suffer 3d10 damage. If this damage is enough to kill them, their head explodes. If they're not nearby, someone else at random within 100' suffers the same effect. This effect will kill most ordinary people. Psychic hurricane. Every sentient being within 50' of the Blighted individual feels powerful psychic forces clawing at their minds, trying to tear their psyche to shreds. Anyone who fails a WILL roll takes 1d10 damage and can do nothing except roll around screaming for the next 1d6 rounds. If this occurs in a populated area, assume a 50% death rate within the affected zone. Nightmare plague. Every sentient being within 100' must make a WILL save or spend the next 2d6 hours suffering grotesque and terrifying hallucinations. Sufferers will flee, screaming, in a random direction, totally regardless of their own safety. Anyone trying to stop or restrain them will be seen as a nightmare-monster and attacked with lethal force. Psychic holocaust. Every sentient being within 100' must make a WILL save or suffer 3d10 damage as blood vessels burst within them. Anyone killed by this damage explodes into bloody ruin, painting everything around them red with blood and gore. (If this occurs within a populated area, simply assume a 75% death rate within the affected zone.) The Blighted individual collapses into a coma for 1d6 days, and permanently increases their Psychic Instability by 1. You can only use simple weapons, and cannot use shields, or any armour heavier than heavy leather (AC +3). You get 1d4 HP per level. You gain a bonus to all attack rolls (melee, ranged, and psychic) equal to one-half of your level, rounded down. You must keep your emotions ruthlessly restrained at all times. If you ever allow yourself to behave in an emotional or impassioned manner, you must immediately make a WILL save. If you fail, roll on the Psychic Outburst table above as though you had a Psychic Instability of 1. At will, you can perform feats of telekinesis on nearby objects (maximum range 10' + 5' per level.) For as long as you stand still and devote your entire concentration to moving the object with your mind, it moves around as though it was being lifted by someone whose Strength and Dexterity were equal to your Wisdom and Intelligence, respectively. This movement is slow, and cannot usually be used to make attacks. You can move a number of objects equal to your level, but you must divide your total psychic ‘strength’ amongst them: so a third-level Adept with Wisdom 12 could move two objects as though each was being moved by someone with Strength 6, or three as though each was being moved by someone with Strength 4. At will, you can launch a psychic attack on a nearby target by directly striking at their mind, inflicting 1d6 damage. Subtract their WILL save number from 25: this is their effective AC against this attack. You may apply your Wisdom modifier as a bonus to both the attack roll and damage roll. By looking directly at someone and concentrating, you may attempt to read their surface thoughts. They will be subconsciously aware that you are doing this, and may resist it by making a WILL save; if they pass, you take 1d3 damage from psychic feedback and cannot attempt to read their mind again that day. Otherwise, you are aware of their surface thoughts for as long as you maintain concentration and they remain in your visual range. Starting equipment: Long traveller's coat (treat as buff jacket, +2 AC), staff (1d6 damage), tiny icon of the Sage of the Diamond Mind, humourless expression, 3d6 x10 sp. According to Khitan legend, the Khitan people were once led by a chief named Naihe. Naihe was a great leader, but he was also deeply eccentric: he never left his yurt unless there was some kind of serious problem, and even then only when a horse and an ox were offered up as sacrifices outside. Then he would come out, solve the problem, and return to his yurt, not to emerge again until the next crisis. Eventually the people grew curious, and sneaked into the yurt to spy on him; but inside they found, not a man, but just an old skull wrapped up in a rug. After that Naihe would not return to them, no matter how many offerings were made to him, so they picked a new chief, named Waihe, instead. Waihe wore the head of a boar at all times and went around wrapped in a pigskin, but at least they were pretty sure that he wasn't just a skull. If, once again, we follow D&D tradition and transform this unique magical creature into a standard type, we get the Skull Chieftains: spirits stored in the preserved skulls of tribal leaders and champions of ages past, who are called forth through sacrificial rituals in order to aid their people once more in times of dire need. Here's how it works: if a great leader or warrior dies in his sleep, then there is a chance that his spirit might not realise that he's actually dead yet. If his tribesmen then quickly cut off his head, roll it in a blanket, and put it back in the middle of his yurt, singing soothing songs to it continuously as they do so, the spirit may (50% chance) stay asleep; and as long as it sees only its familiar yurt around it, and no-one comes in to disturb its rest, it can potentially slumber inside its skull indefinitely. Shh! He's sleeping! Don't wake him up! The tribe will carry the yurt with them from place to place as they travel, setting it up each time they pitch camp, but always taking the greatest care not to disturb the spirit-skull resting inside. When some kind of emergency arises, they will sacrifice a horse and an ox outside the yurt and call for the warrior within to come forth and lead them; the life-force from the sacrifices will empower the spirit, and it will put forth a mortal body once more and emerge to lead or fight alongside the tribe until the emergency is dealt with. The resulting spirit-warrior doesn't know that it is dead: it is willfully blind to most of the evidence of time and change around it, but if any especially striking instance is brought to its attention (e.g. hearing a song about its own death, being greeted as 'great-grandfather' by one of its living descendants, etc), it has a 50% chance of 'waking up' and returning to the afterlife at once, leaving nothing behind it but a mouldering old skull. Intelligent enemies will want to take advantage of this. Risen, they look kinda like this. Art by Ryan Lee. When peace returns, there is a 20% chance that the spirit will clear its head and depart for the afterlife; otherwise, it will be overcome with weariness and return to its yurt to sleep once more. 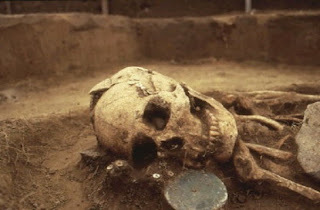 If the skull is disturbed while sleeping in its yurt - by someone coming in and making a racket, for example - then the spirit will have a 75% chance of waking up and departing; if the skull itself is disturbed or damaged, then the spirit will wake up and depart at once. For this reason, when one tribe makes a surprise attack on the camp of its rivals, the yurts of the sleeping Skull Chieftains are usually their first target. Skull Chieftain (Great Warrior): AC 16 (ghostly armour), 6 HD, +7 to hit, sword (1d8+1 damage) or bow (1d8+1 damage), FORT 8, REF 8, WILL 8, morale 9. Skull Chieftain (Great Leader): AC 15 (ghostly armour), 4 HD, +4 to hit, sword (1d8 damage) or bow (1d8 damage), FORT 10, REF 10, WILL 10, morale 10. All tribesmen whom the great leader personally leads into battle gain a +1 bonus to hit, damage, and morale. D&D has a proud tradition of creating monster races out of what, in their original mythologies, were unique creatures: thus Medusa (the woman) becomes medusae (the species), and so on. In these posts I'm going to be giving various creatures from Central Asian mythology a similar treatment. In Tengri mythology, the god of the underworld is Erlik, who appears to shamans as a muscular man with the face of a pig. Erlik was the first and worst being made by the divine creator, and his botched attempts to make a world of his own are responsible for the existence of bogs and other wretched places in the world today. (If you've ever been somewhere that just seemed really, deeply bad, as though it had been put together wrongly on some kind of basic metaphysical level, it's probably because that's one of the bits of the world that Erlik got his hands on right back at the beginning.) He wants to create, but can bring forth only awfulness: diseases and darkness, gods of evil and chaos, and wicked spirits who deceive vision-questing shamans and lure them away from the truth. He was locked away in the underworld long ago, but those whose relatives die of disease still need to offer up propitiatory prayers to him lest he drag his victims down through the earth to be his slaves. As Tengrism is a living religion, I would feel slightly uncomfortable putting Erlik himself into a game; it would feel a bit like introducing Lucifer as the Big Bad in a game-world which didn't otherwise make use of Christian theology or function according to the rules of Christian metaphysics. But just as I'm happy for games to feature demon-monsters based on Lucifer and his pals, so too with our pig-faced buddy Erlik. Thus: the pig-men. I may also have been influenced by my love of Darkest Dungeon. Pig-men look like men with the faces and teeth of pigs... sort of. Whatever put them together clearly didn't really know what it was doing, and they're twisted and misshapen in all kinds of bizarre and horrible ways. Sometimes their anatomy doesn't even make sense, as though their creator had seen the inside of a human body but didn't quite understand what all the different body parts were for: cut them open and you might find internal organs which don't connect to anything, or in the wrong numbers, or in the wrong places. However, even when the result should be totally fatal - like a pig-man with three hearts, none of which actually connect to his lungs - they still somehow manage to stumble on, as though powered less by flesh and blood than by sheer spite. The pig-men are feeling greedy and want you to give them something: food, slaves, shiny things, or whatever else they think that you might have and they might want. If refused point-blank they'll take what they want by force, but can probably be talked into accepting something different instead so long as it's presented as some kind of gift. The pig-men are busy with some disgusting activity of their own, and will not bother you unless disturbed. The pig-men are feeling curious. They want to know about you and all the objects that you're carrying; they won't be satisfied until they've actively sniffed, licked, chewed, and prodded everything they can get their hands on. The best way to deal with them is probably to persuade them that something else is even more interesting than you are. The pig-men are feeling lonely, and will try to make friends. They will offer various crude, filthy, and worthless objects as gifts, and make nonsensical compliments (e.g. 'your hair is very hairy', 'I like how clever your thigh is') in the hope of winning you over. They will become angry and violent if their advances are rebuffed. In a fight, pig-men attack in a chaotic mob, throwing rocks and whacking enemies with crude spiky clubs. They're very strong, but they're also cowardly, disorganised, and not very bright, and are thus usually dangerous only in overwhelming numbers. If they manage to get hold of guns they will have enough intelligence to aim and fire them, but not to reload them. (Some keep a luckless human captive for this purpose.) Their teeth and weapons are filthy, and their flesh is riddled with diseases: anyone wounded by them must make a FORT save or contract some kind of disease. Anyone stupid enough to eat pig-man bacon immediately contracts 1d6 different diseases with no save permitted. They can see perfectly in the dark. Pig-Man: AC 13 (hide and blubber), 2 HD, +2 to hit, spiked club (1d6+1 damage) or thrown rock (1d3+1 damage), FORT 12, REF 15, WILL 16, morale 6, special attacks: disease. Because there's no clerical healing magic in ATWC, I've tried to add other ways for PCs to recover lost hit points. Most of the classes have some ability for speeding up natural healing, and Disciples of the Word can whisper people back to health at a pretty impressive rate, but none of this makes up for the absence of in-combat healing. Thus, healing potions. Except... healing potions are kinda boring, aren't they? And they're either nonsensical ('I drank this herbal remedy and my gunshot wound closed up!') or imply a kind of high-magic economy which would be totally out of place in ATWC. So I came up with an alternative, in the form of a 'natural' source of expensive-but-not-totally-unaffordable magical healing liquids: the Crimson Lake. Red Lake, New Zealand. Photo by Milton Bell. Of all the beasts and behemoths created by the sorcerers of the Age of Wonders, the greatest and most terrible was the Red Leviathan, an immense dragon-crocodile so fierce and wild that even the sorcerer who created it was unable to control it. When he found that he could neither tame the beast nor kill it, he imprisoned it in a great cavern beneath his city, hoping it would starve to death; but such was the furious life-force that burned within it that it lived on, roaring and raging, no matter how many years of famine it endured. When the wars came, and the city fell, the sorcerer unleashed the Red Leviathan as a final act of desperation, and it proceeded to ravage both the city and the army attacking it; it then wandered into the wilds, and for years it roamed the land, destroying and devouring everything in its path. At last, three sorcerer-kings formed an alliance of convenience to slay the beast, and sent their God Soldiers to converge upon it. The resulting battle tore the land open for miles about; and when it ended, most of the God Soldiers lay in shattered ruins around the prone body of the Red Leviathan, which was scored with a thousand terrible wounds and pinned to the rock by a hundred terrible spears. It looked a bit like this except a mile long. Image by DenaJarawr. There the matter should have ended: but the Leviathan simply did not know how to die. Rains fell, and the wreckage-filled crater in which it lay filled with water, becoming a lake; but beneath the surface the great beast’s heart still beat, pumping its blood into the waters. The lake turned red with mingled rust and blood, and the plants which drew water from it grew huge and red and twisted, and the animals which drank from it grew wild and fearless and could not be tamed. Today, the Crimson Lake is surrounded by a weird, ruddy wilderness, where huge and ferocious red-furred beasts stalk through sharp red grass that grows eight or nine feet high. Sometimes the Red Leviathan twists and roars, trying to free itself, and then the land shakes for miles around. The savage tribes that live round about send their young men into it as a test of manhood, bidding them drink from the red waters and grow strong; the greatest of their warriors, those who boast that they have drunk from the Crimson Lake a hundred times, tend to become great, towering brutes, marked with ungainly masses of bulging muscle and thick red sinews that run like ropes beneath their skin. In the world outside, the waters of the Crimson Lake are much sought after for their healing properties; but the traders who ride there with their wagons full of barrels must pay their caravan guards well, for it is not uncommon for less than half of them to return to tell the tale. Elixir of Life: Drinking the waters of the Crimson Lake really does heal and strengthen the body. Just gulping down as much of it as you can drink heals 1d3 damage and grants a +1 bonus to strength and FORT for the next hour; you can do this every hour as long as there's enough lake-water available for you to drink. Drinking nothing but lake water (and lots of it) for a full day gives your skin and hair a slight reddish tinge that lasts for weeks, and grants a +1 bonus to strength, attack, damage, and FORT rolls for as long as you keep drinking it, and 1d3 extra days thereafter. If you spend a number of consecutive days equal to your strength drinking nothing but lake water, your strength increases by one point permanently, and your skin and hair turn slightly redder than they were before. People who do this over and over again, repeatedly increasing their strength (to a maximum of 18), will end up with bright-red skin and hair and heaps of weird new muscle groups bulging out all over the place. Doing this means surviving for months in the middle of a savage wilderness roamed by giant, hyper-aggressive red monster-beasts, so anyone who's managed it is obviously a total badass and should be treated with extreme caution. Crimson Lake water evaporates as easily as any other kind, but a skilled alchemist can condense an entire barrel of the stuff into a powerful concentrate of just a few ounces, which will last for years if properly preserved. Because the concentrate delivers its effects all at once, in a single powerful 'hit', it's much more addictive than the lake-water; anyone who drinks a number of vials greater than their constitution score in a single day must make a FORT save or develop a craving for the drug, so powerful that it requires a WILL save to avoid taking more whenever the opportunity to do so arises. (If multiple vials are available, an additional WILL save is permitted after each one to stop yourself from also drinking the next.) Anyone who drinks a number of vials of concentrate in a single day greater than twice their constitution score must make a FORT save or suffer a fatal overdose. Drinking a single vial of this concentrate has the same effect as filling your belly with lake-water (i.e. heal 1d3 HP and gain +1 strength and FORT for an hour), and drinking a number of them equal to your strength score within the same 24-hour period has the same effect as drinking the lake's waters for a full day. If you just keep drinking the stuff then it's even possible to get permanent strength gain, as from drinking the lake water itself, although this will require hundreds of vials worth of concentrate and cost a fortune. For an individual of average strength to raise themselves to Strength 18 by this method would require about 1400 vials consumed over three or four months, the collective cost of which would be well out of reach for all but the very wealthiest of men. See? They're romantic! Image by Deltamike. Like a lot of people, I kinda love airships. There's something magical about them; perhaps more than any other form of transportation, they feel like something from a fantasy novel, rather than from real history. Probably it's the weightlessness, the sense of effortless movement, which makes them feel as though they transcend all the ordinary laws of mass and motion. For planes and helicopters, take-off is a strenuous affair, all roaring motors and spinning propellers. An airship just... ascends. In RPGs, though, I've learned to my cost that they need to be handled with care. Give PCs access to efficient air transportation and you've basically handed them an excuse never to trek through a dangerous wilderness ever again; they'll just fly straight to where they're going, skipping whatever's on the ground. You risk trivializing a lot of traditional monsters: anything without effective long-ranged attacks can simply be killed by raining missiles down on it from above. You trivialise obstacles: city gates, castle walls, and impassable forests can all just be drifted over. Geography loses its impact, which is a big deal in a setting inspired by central Asia: the landscape which had such a powerful effect on the history and culture of the region suddenly becomes an irrelevance. Why walk the Silk Road when you can just fly direct from east to west? These aren't just hot air balloons; their airbags are full of something like helium, non-flammable and lighter than air. This is primarily manufactured by the Serpent Folk; the Blue Folk, children of the element of air, also know how to synthesise it by magical means, but they're usually unwilling to sell it to outsiders. Manufacturing this gas requires a high level of alchemical expertise and extremely expensive components and equipment, which means that it's expensive: really, really expensive. Getting enough gas to fill the airbag of an airship can easily cost more than building the damn thing in the first place; and given that some gas is inevitably lost on every journey due to routine wear and tear, transporting a given weight by airship is something like one hundred times as expensive as sending it by horse or boat instead. Because of the astronomical cost of lighter-than-air gas, airships are built to be as lightweight as possible; every pound shaved off the weight of the hull is a pound that doesn't have to be paid for in additional gas. The result is that most airships are extremely flimsy: ultralight frameworks of wood and metal, covered in tightly stretched canvas. They can carry only the lightest of cargoes, and any kind of damage or collision will pretty much wreck them. Their airbags are covered with thicker canvas, but any serious projectile (a bullet, an arrow) will still penetrate it, causing a potentially catastrophic leakage of the gas inside. Airships steer by means of sails, rudders, and small clockwork propellers to provide thrust. Because they're so lightweight, however, their ability to cope with stronger winds is very limited; once you hit anything stronger than a stiff breeze, you're basically going to go in the direction the wind is blowing, whether you like it or not. Given the strength of the winds across the steppe and the desert, this usually means that trying to fly anywhere except in the direction of the prevailing winds is an exercise in futility. Storms will simply wreck you unless you're very skilled, very lucky, or both. Most vertical movement is accomplished by adjusting the angle of the sails, allowing the wind and the air currents to gradually carry the ship up or down; but when you want to change height now, the only option is to adjust the mass of the airship itself. Every airship carries a certain amount of weight to manoeuvre with. When the pilot wants to go up, he throws some weight overboard; when he wants to go down, he lets some gas (the precious, precious gas) out of the airbag. When he's reached his desired height, he needs to ensure that weight and gas are in almost perfect equilibrium. In theory, landing is just a matter of letting out a tiny bit more gas so that the airship as a whole becomes slightly heavier than air, and allowing it to drift slowly downwards. In practise, doing any of these things with a wind blowing is a nightmare, and usually ends up wasting far more weight and/or gas than you'd hoped it would. Remember that landing on trees, or flying into them because you've been hit by a down-draft and have no spare weight to throw overboard, will rip your airship to pieces. Funnily enough, no-one ever tries flying airships over the taiga. Elite teams of spies, assassins, and special forces being air-dropped on one-way trips deep into enemy territory. Extremely valuable, highly-perishable luxury goods being raced from their place of production to the homes of customers willing to pay enormously high prices for them. Eagle-eyed scouts with telescopes scouting out the movement of enemy armies in wartime. Thieves or other criminals who need to make a really quick getaway. Small teams of crazy adventurers trying to reach somewhere which is totally inaccessible by any other means. It's all worth it for the view, though. Image by aninael. You can use airships for military purposes. You can load up a few barrels of gunpowder, fly directly above your enemies, and drop them from a great height. You will want to make sure you get the fuse length exactly right, though, or they'll explode harmlessly in mid-air. This is most effective on stationary targets, such as besieged cities, but even then the efficacy of each bombing run is strictly limited by the small amount of ammunition that can be carried on each flight. Dropping big rocks is right out: the weight is just too much for an airship to deal with. Most generals stick to using their airships for scouting purposes. Anyone can learn to fly an airship with a bit of practise, but only a traveller can safely and reliably pilot one through combat conditions, strong winds, etc; their extraordinary sense of weather, movement, and distance makes them far better at it than any other class. Anyone else will need to make lots of Wisdom and Dexterity checks whenever things get rough. Even travellers will want to avoid flying in extreme weather if at all possible. You can't use an airship to fly straight to the Lost Temple because you can't afford to buy that much Magic Airship Gas from the serpent folk, and because the Lost Temple is halfway up a storm-wracked mountain into which you are certain to crash your airship, and because the chances of your ship surviving to carry you back again are totally minuscule and its tiny cargo capacity won't let you pack enough supplies for the lengthy return journey on foot. Just go by horse instead. If someone is shooting at your airship from a range where they might actually hit then you are all fucked and you need to either get away from them or get off the airship as quickly as possible. Your airship is stupidly fragile, and every bullet-hole in the airbag is going to cost you a fortune in lost gas. If you have to kill them, then either do it from an enormous height (so they can't shoot back) or land and fight them on foot. Trying to engage them while riding a flying canvas deathtrap is a terrible idea that will get you all horribly killed. Mid-air battles between two airships are essentially the world's most expensive version of Russian roulette. Airships are a great place to take someone for a first date.